As part of the Low Impact City Logistics project, UPS has developed a fleet of electric bike trailers to be used for deliveries in and around London. 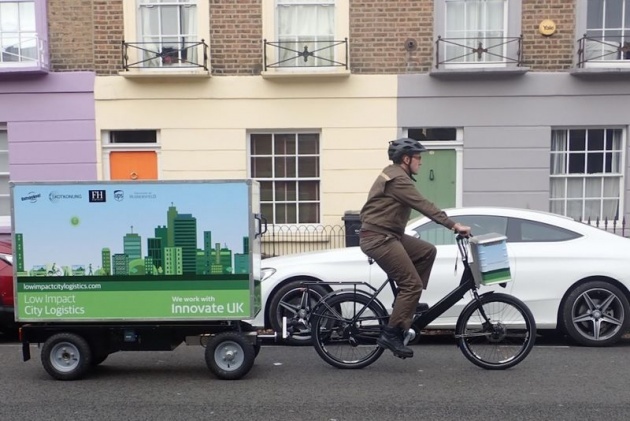 Innovate UK, a semi-public administrative body outside the civil service but receiving financial support from the government, raised £10 million for an R&D team to develop the bikes in an effort to help UPS provide a more “net neutral” alternative to its traditional delivery vehicles. The bikes will roll out in Camden this month and next month. The hope is that by deploying them in highly trafficked areas, delivery times are faster and the carbon footprint is reduced. Couriers also get a lift from the all-electric option as they don’t have to employ foot power while carrying up to 440 pounds.